I'm in favor of second chances for all offenders, terrorists included. But it is beyond the pale that Indonesia allows second chances for militant bomb-makers who participated in acts of terrorism to get out of jail and become productive citizens, while foreign drug traffickers, even mules, face death. There are beautiful beaches all over the world. 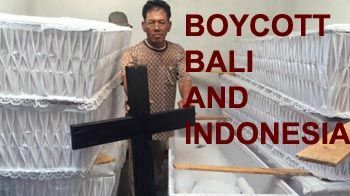 If you are vacationing this summer, please skip Bali and Indonesia. Visit the Seychelles, Maldives, Mauritius, Fiji, and other beautiful places that don't kill non-violent drug offenders. Indonesia has long coddled terrorists while showing no mercy or tolerance for non-violent drug offenders, especially foreigners. Here's another example .